I know what you're thinking, not another tribute mix. Well, I wouldn't post the mix if I didn't think it was worth your time. 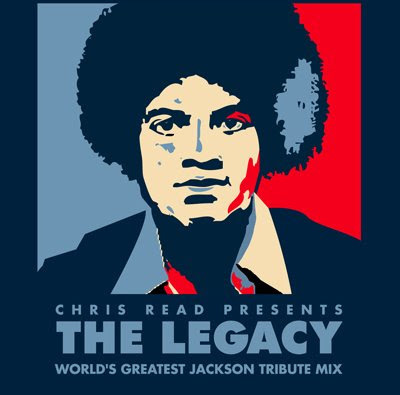 My man Chris Read claims that this is the greatest Michael Jackson tribute mix in the world. You know what? I don't necessarily disagree with him. Below is Chris Read's explanation of the mix. "I know what you're thinking, the last thing world needs right now is yet another Michael Jackson tribute mixtape? Believe me, I'm pretty much of the same opinion and I didn't take the decision to do this lightly, but the flood of (in too many cases) pretty half baked tribute mixes, radio shows, podcasts over the past week kind of got under my skin. It seemed almost as though people were putting more effort into being the first to get something out than they were into a making decent job of it. I'm of the view that if you're going to mark somebody's life's work, the least you can do is pay some respect by putting some proper work into it. So that's what I did. Just over a week after Michael's passing, I'm pleased to present what I've (humbly) called THE LEGACY: World's Greatest Jackson Tribute Mix! - 60 minutes, 45 tracks, featuring a selection of Michael Jackson and The Jackson 5's original works, edits, acapellas and demos accompanied by records that have sampled them, cover versions, tributes and remixes from the likes of Dwele, Dilla, DJ Spinna and Ian Brown amongst others. All that laced with original interviews and some heavy edits. It's been a labour of love, but I'm feeling like it was worth it." I pretty much stayed away from all the tribute mixes with the exception of J Rocc's (and wished I didn't hear that too) but since you co-signing this mix Pipo I gonna listen this one. I too have stayed away from all the Mike Jack mixes, but if this is anything like "The Diary" Mix... I can't resist.